“God, Will I Ever Find Happiness? The Journey Toward Healing Your Inner Child” from Christian Faith Publishing author Mitzy reveals how peace, love, and, most important of all, happiness are possible for all. “God, Will I Ever Find Happiness? 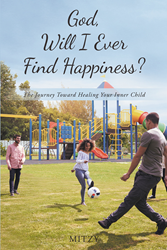 The Journey Toward Healing Your Inner Child” is the creation of published author, Mitzy. Mitzy is a phenomenal angelic/biblical Illustrator, author, and inspirational speaker from Jacksonville, Florida. She holds a degree in psychology and studio art from Spelman College. Mitzy is currently pursuing a master of divinity degree with a specialization in pastoral care from McAfee School of Theology. Raised by older parents, she was privileged to witness their generous wisdom. Since a young age, Mitzy has been described by many as a youthful woman who is wise beyond her years. Through her art, writing, and speaking, she offers her heart, wisdom, and love to those who are ready and willing to transform their lives. Published by Christian Faith Publishing, Mitzy’s new book shows happiness is possible for all. Facing hopelessness, author Mitzy often found herself questioning God as to whether or not she would ever find happiness. By the virtue of simply asking, she embarked on a process of searching. “God, Will I Ever Find Happiness? The Journey Toward Healing Your Inner Child” was born from her desire to know if there was more to life. The answer was yes. Peace, love, and, most important of all, happiness are possible for all. Through her personal experiences with hardship and depression, Mitzy provides wisdom to others that can help them become the conquerors they were born and created to be. This book provides guidance and useful tools for those struggling to enjoy life to the fullest. The purpose of this book is to let others know that happiness is possible for everyone. View a synopsis of “God, Will I Ever Find Happiness? The Journey Toward Healing Your Inner Child” on YouTube. Consumers can purchase “God, Will I Ever Find Happiness? The Journey Toward Healing Your Inner Child” at traditional brick & mortar bookstores, or online at Amazon.com, Apple iTunes store, or Barnes and Noble. For additional information or inquiries about “God, Will I Ever Find Happiness? The Journey Toward Healing Your Inner Child”, contact the Christian Faith Publishing media department at 866-554-0919.